The modern world is full of stress and we are often in a big hurry. This means that things, like leaving your keys inside and getting locked out of house, is a pretty common occurrence. Once you discover what has happened it can be pretty stressful. Because of the fact that this is likely to happen to you sooner or later, it’s better if you make a plan before it occurs. Here we’ll take a look at what you can do if you get locked out of house. We usually assume that our windows are locked and it may be best that they are but many of us will leave one unlocked after a night of letting in fresh air. It only takes a few minutes to see if one might be unlocked that is low enough for you to crawl through. If it is, it will make it very easy for you to get back in the house to grab your keys. Once you find a window that’s unlocked it will only require your removing the screen to get inside. 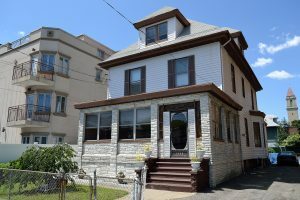 It’s important to be careful when entering your home through the window because you don’t want to hurt yourself or your property. As you enter there will be furniture and there may be a lamp or something else in your way and you don’t want to knock those things over and break them. 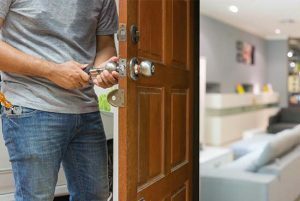 If you have a roommate, or a spouse, or even a child that also has a key and they’re available then they’ll be the perfect choice to ask that they come and unlock the door. If it’s super cold outside and you don’t have a warm place to wait it could be uncomfortable until they can come but it is one solution. If you live in a rental, then you can usually call your landlord or the rental management to get a spare key from them or have someone come and let you in. They may require you to prove who you are if they don’t already know. You may not think to try using a credit card like you see in the movies but there are certain types of locks where this can work. 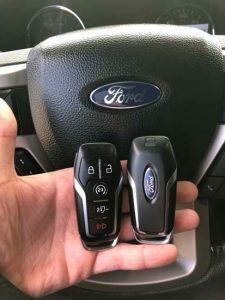 A deadlock cannot be jimmied with a credit card but if you forgot your keys deadlocks are usually not a concern because they usually require being locked from the outside and so they likely will be open. If the remaining lock is spring loaded then this is a perfect situation for a credit card. Of course, it doesn’t have to be a credit card as any laminated card will do. When possible, try using a card that you won’t mind if it gets scratched or broken. You’ll want to work the card into the door frame just above where the lock is located. Then try pushing and wiggling the card in an effort to get the lock open. You’ll need to bend the card away from the door knob so that it works into the door jam. While you are doing that you’ll want to use your body weight to push on the door to try and get it to open. 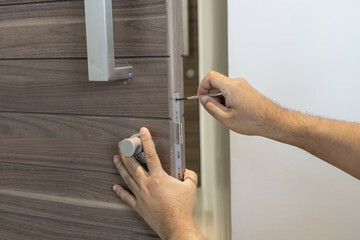 The easiest and most practical solution to being locked out of your home is to call on a professional locksmith. They are very often able to respond quickly and they can come to the home and easily access the lock allowing you to enter your home and grab your keys. For the average person, this investment is well worth it as it will be fast and it will save you the headache of the other possibilities you could choose. 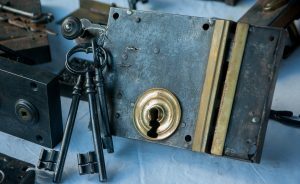 Your might even consider having them inspect the locks on your home to make sure that they are secure from others being able to access the home without a key. This will mean that you can use the experience of being locked out of your home for something more than just being able to retrieve your keys. That way you are less likely to feel as bad about the cost of having a locksmith out. 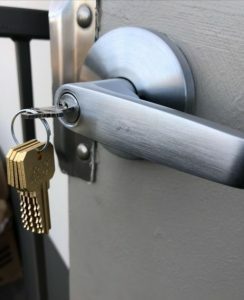 Since you have the locksmith out anyway, you should talk to them about installing a keyless entry. This could save you the trouble of having to worry about forgetting your keys again. Your locksmith may well be able to install such a lock and it can give you another option when you forget your key. These often have a key code that can be entered to unlock the door without a key. This makes for a highly secure solution that removes the worry of ever forgetting your key again.